Yes, I’ve made another Bellini from Capital Chic Patterns, but I’m not sure where my head was at because I didn’t try it on until I got to the buttonhole stage only to discover that I had made the smaller size by mistake. Far out – I was not going to throw it away. I unpicked the side seams and that pin hem and decided to put a stripe in the sides. The only way to show the side seam is to look like I am anxious to answer a question in class – sir! sir! pick me!! I also tried the scalloped collar, which is one of the things that attracted me to this pattern in the first place. Even when I sit like this the shirt doesn’t gape at the front so this solution was a total success. So what can I say? Snatched from the jaws of the recycling bin. The fabric is from my sister’s stash cunningly destashed to me. It is a sweetly printed cotton. I used buttons that I had leftover from my Mary Quant phase and which can’t be seen from a distance, so here is a closeup. The photo was taken before I washed out the chalk marks. 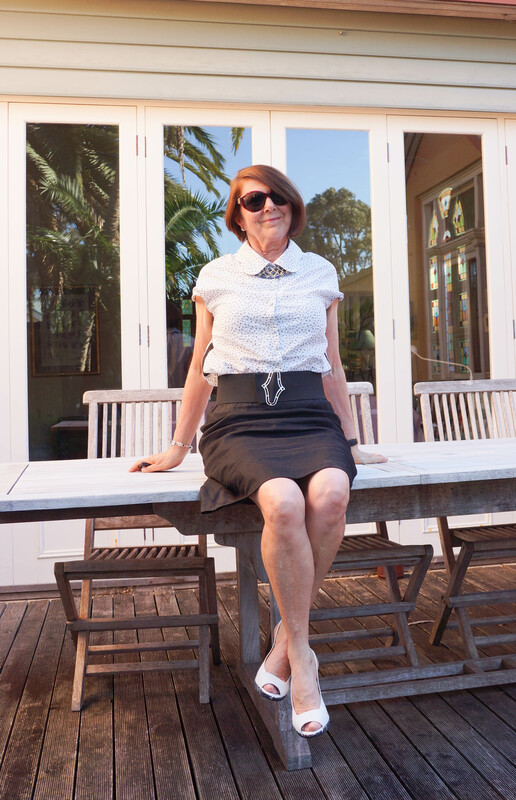 I teamed it with my Champagne skirt also from Capital Chic Patterns, and the stripes down the sides of the blouse are made from the same ramie fabric as the skirt. The belt is a piece of wide elastic with an Edwardian silver buckle. Shoes are Letizia from Letizia in Claremont. The necklace is from Heaven Wrapped and I made the bracelet. As usual, I am looking rumpled, this was taken after a day at work and a long drive home. 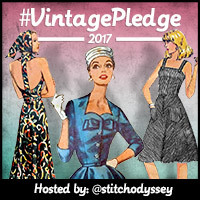 I’ve been nominated for the blog hop by Carolyn and will be answering the questions in my next post when I have finalised my nominees. What an ingenious solution. So glad you were able to save this beautiful blouse. The scalloped collar is a nice detail. That is such a pretty shirt Sue, the fabric looks quite lovely. In fact your whole outfit looks very elegant! Wow! That was a really clever solution Sue. 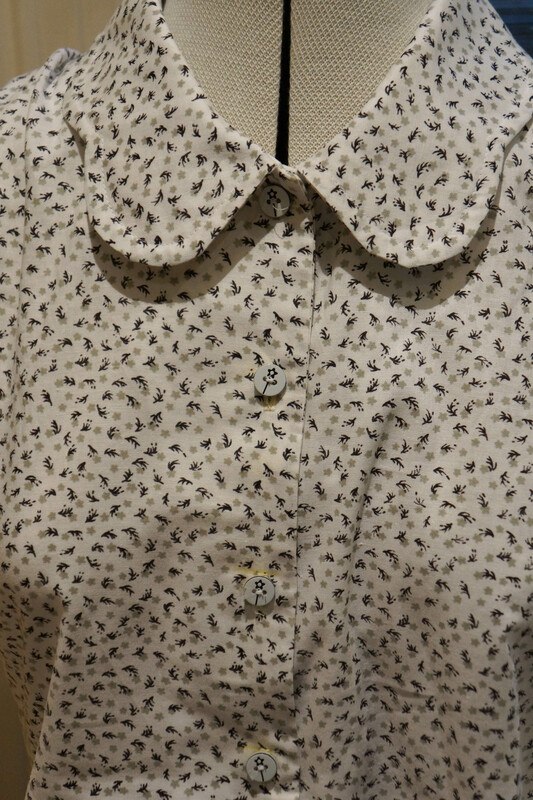 A close-up of the blouse really does it justice … print is just beautiful and I adore those buttons. Great way to save your beautiful blouse and the buttons are perfect.